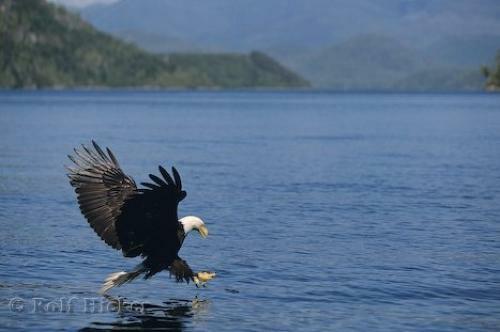 A majestic Bald Eagle swoops down to the water, fishing in the waters off Vancouver Island, British Columbia, Canada. This Bald Eagle circled around in the sky before swooping down and fishing in the waters off Vancouver Island in British Columbia, Canada. With it's sharp eyesight the Bald Eagle first spotted it's prey from high up in the air. When fishing, an eagle uses it's powerful talons to grasp it's prey and lift it out of the water. Bald Eagles are efficient birds of prey and well adapted for fishing. Other related pages for the topic "eagles and animals"
Photo of a Bald Eagle with outstretched talons, fishing off Vancouver Island in British Columbia, Canada.